Ottawa-born artist Philip Craig was encouraged by his parents to pursue art from an early age. Following his studies at Sheridan College of Art and Design, he spent the following decade in Newfoundland, where his more isolated surroundings allowed him to focus on traditional subject matter: landscape, portraiture and still life. He eventually returned to Ottawa, determined to paint full-time. Various travels to England, France, Italy, Morocco and India not only enriched his palette, but also provided him with a deeper appreciation of light, which became a mainstay in his oeuvre. 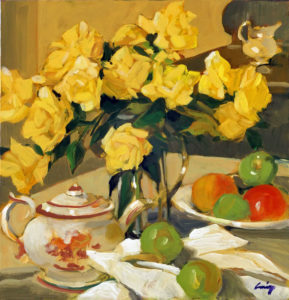 In the painting Craig created specially for Art Gems, he employs rich colours and intense lighting; the viewer wants to be there, to be a part of the lush interior scene. The element of connection, accompanied by the beauty of colour, light and richly expressive brushwork, creates a desire to live within his paintings. This extraordinary ability to connect with the viewer exists whether Craig is depicting ordinary activities, landscapes or interior scenes. Craig’s work can be found in collections in Canada, the United States and England. He is represented by Loch Gallery in Toronto.